spiral binding, plastic coils manufacturer, Plastikoil 1 (800) 665-7884. Outside North America call 1 (204) 663-9214. PLASTIKOIL® plastic spiral binding – The world's largest plastic coil manufacturer. Our product is PLASTIKOIL® - the most attractive and functional mechanical binding system on the market. 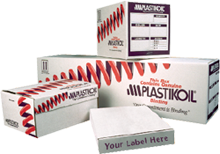 Made from the highest grade compounds, PLASTIKOIL® plastic spiral binding sets the industry's standards. Strong and durable - yet flexible and lightweight. Pages will never pull apart and the coil will not bend or distort during shipping. PLASTIKOIL® bound books lay flat when opened - with the ability to fold back a full 360 degrees. PLASTIKOIL® is available in 45 different colors - in coil diameters from 6 mm (1/4") to 50 mm (2"). Custom colors; custom lengths; all pitch options. Our Service - At Gateway Bookbinding Systems 'customer service' is not just a phrase - it's a state of mind. Being able to immediately respond to our customers' needs is our #1 priority. Our production departments and customer service reps understand the need to be flexible and responsive to a client's demands - often amazing our customers with almost instantaneous order processing. Diameter / Pitch Options - PLASTIKOIL® is available in coil diameters from 6 mm (1/4") up to 50 mm (2"). Gateway is also able to manufacture virtually every pitch of coil on the market - including 4:1 / .2475" / 6 mm / 3:1 / 2.5:1 / 3.2:1 / 5:1. A measuring device/slide chart to enable the user to determine the correct diameter of coil for a binding job. Manufactured from the highest quality pvc compounds. Strong and durable. A PLASTIKOIL® by-product produced from over 95% post-commercial waste. Another environmentally friendly alternative. A reclaimed plastic produced from over 95% post-commercial waste. A plastic spiral binding manufactured with PETG compounds that are fully recyclable. 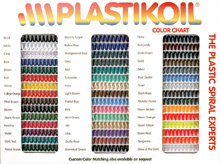 45 PLASTIKOIL® colors. A handy reference guide / a great marketing tool. Whether you want coil to be bulk packed or you prefer 100 lot boxes - Gateway can meet your needs. name and contact information. We make it easy for you to look good!